He is the son of Shiva and Parvati/Mahadevi, and although he has a very large body and is playful in nature, he is also quite graceful and completely fearless. According to tradition, Shiva granted his son the boon that one must worship Ganesha first before beginning any other worship, and so this is why every puja begins with worship of Ganesha. Ganesha is a loving and lovable Lord, recognized primarily as the God who has an elephant head. His name, Ganapati or Ganesha, means “Lord of the Multitudes,” and refers to his strength and power over evil, as well as his ability to protect and lead. His large ears are attuned to the voices of his devotees, who call to him for help in removing any obstacles in life, whether for worship, personal safety, or to achieve a goal or higher purpose. Ganesha also aids in the purification of the worshipper, removing our internal obstacles. He is the guardian of the gate, the keeper of the doorway, and so many Hindu and Jain families keep an image of Ganesha at their doorway to ward off bad energies and welcome good ones. Ganesha is also a guardian of the Muladhara Chakra, the energy center at the base of the spine which is where the Goddess Kundalini lies sleeping. He is the guardian of Devi, and also Her son. As such, he is the gatekeeper for all worship of MAA, and acknowledging him through worship allows us to be in the right mindset for approaching our Divine Mother. As a Tantric deity, Ganesha is a great aid to the sadhaka who seeks to awaken Kundalini through sadhana, as he is the deification of the process of opening the pathways of consciousness to the full force of our own shakti. The first mantra is recited to worship the Ganesha that is carved into the southern niche on the outside of the Sri Sri Kamakhya temple in Guwahati. Devotees recite this mantra, leaving a coin at Ganesha’s feet and touching their head to the stone upon which he stands, and then walk around the temple in a clockwise direction, before entering the darshan queue or performing other worship. This Ganesha is to be worshipped before entering the temple. 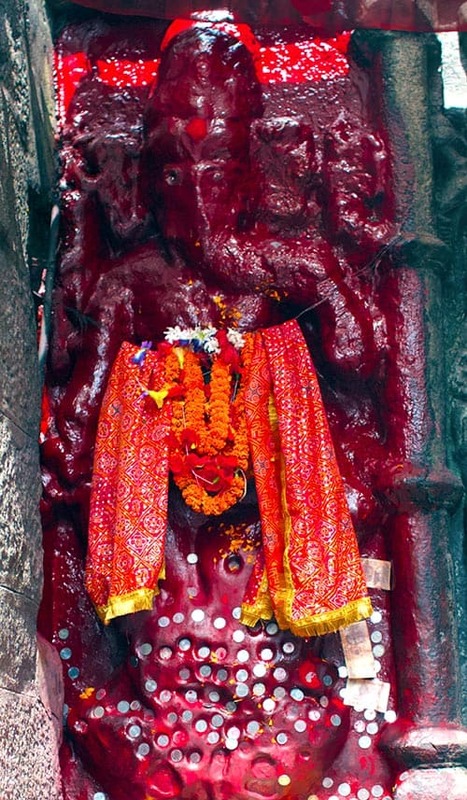 The second mantra is another common mantra used by devotees to worship Ganesha at Kamakhya. This mantra may also be used before beginning worship, or at any other time. Enlisting the help of Ganapati is crucial in helping us to achieve our goal of oneness with MAA. These mantras do not require initiation. Devotees primarily use these mantras before beginning worship, but you may also use them before beginning any venture, to ask Ganesha to remove the obstacles from your heart and mind, and from the path in front of you. Often, our internal obstacles are the greatest and most difficult to move, and so enlisting the help of Ganapati is crucial in helping us to achieve our goal of oneness with MAA.